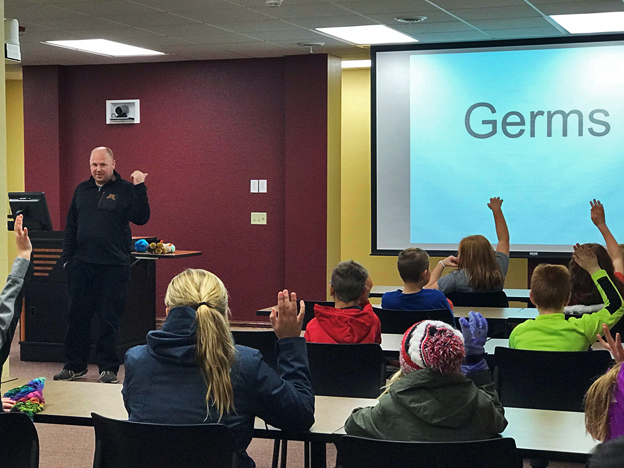 Dr. Tim Johnson, Associate Professor in VBS, hosted 25 students from Roosevelt Elementary School (3rd-5th grades) at the Mid-Central Research and Outreach Center (MCROC) in Willmar, MN on Friday, 11/9/18 as a part of their gifted and talented student program. Dr. Johnson gave them an overview of germs and microbes and then showed them the research lab where "turkey germs" are studied. Johnson will be hosting several schools in the area this year to introduce them to the idea of science and research, and to promote the recruitment of future scientists in rural Minnesota.